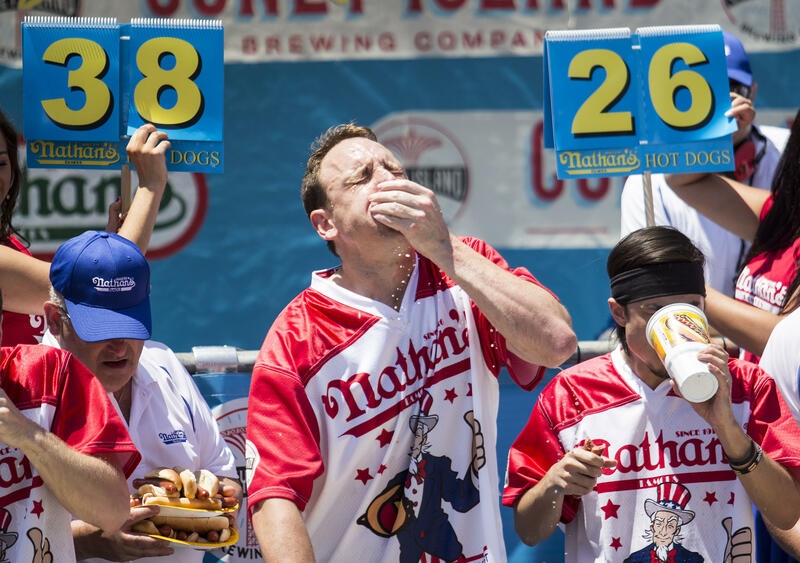 NEW YORK -- Joey Chestnut won the 101st Nathan's Annual Famous International Hot Dog Eating Contest on Tuesday, marking his 10th victory in the event. Chestnut was the reigning champion and favorite heading into the 10-minute race, which attracts the world's hungriest competitive eaters at New York's Coney Island. The 33-year-old set a world record Tuesday by devouring 72 hot dogs. "Next year, if I come back, you can bet I'll be pushing harder," Chestnut told ESPN2 shortly after winning the event. "I treat competitive eating like a sport, it's not like going to a buffet, I'm not a buffet buster. I train, I fast, I tape my practices and try to figure out how to improve. I make my body work for me and I've been really lucky for how its performed." Carmen Cincotti finished the competition in second place with 68 hot dogs, while Matt Stonie placed in third with 48. Last year, Chestnut set the previous record of 70 hot dogs, winning the title back from Stonie, who defeated him back in 2015. "Joey is a monster, it will take a lot to knock him off," Stonie said before the competition, which aired on ESPN2. "On July 4th, I have a goal that begins with an 8," Chestnut said on Twitter days before the competition. "I know [Stonie] and [Cincotti] are making gains. So am I." In the women's competition, 20-year-old Miki Sudo won her fourth-consecutive title by downing 41 hot dogs in 10 minutes. "I came back better prepared than ever, I was just in a really good place mentally," Sudo told ESPN2 after the competition ended. "Physically, I was more than prepared, even before boarding the plane to New York," Sudo continued. "With the overwhelming support and the energy here today, it was hard not to do well." Michelle Lesco came in second place with 32.5 hot dogs. Sonya "Black Widow" Thomas finished the competition in third. She still holds the women's contest record of 45 dogs and buns.